I like my Cabrio! It has not required a single repair since purchase. Although it uses almost no water, it cleans Mr. Fox’s and my laundry just as well as our previous water-guzzling Whirlpool did. To date, I have not taken advantage of Cabrio’s many cleaning features. For instance, I’ve not used the “heavy” cycle. Nine times out of ten I press both the”quick cycle” and “mixed colors” buttons. Only on rare occasions do I activate the “Normal” cycle. The quick cycle, which runs for approximately 36 minutes, does a fine job on moderately soiled clothing. Like all high-efficiency machines, the Cabrio has two special needs. First, following the manufacturer’s directions, I leave the lid up when the machine is not in use. This way, moisture can evaporate, and mildew can’t take hold. Next, and also recommended by the manufacturer, once each month I drop a bleaching tablet into the tub, and select the “clean washer” option. The tub, by the way, is enormous — 5.3 cubic feet. I’ve never filled it to capacity, but it does handle all of my bed linen plus a queen-size comforter in just one load. Would I recommend this machine to you? No, Nanette. Your cleaning needs might be different from mine. Although the Cabrio does a fine cleaning job in a household that counts just one food blogger and one psychologist, I can not possibly predict how the appliance would clean an auto mechanic’s overalls! Well then. You asked for this update. And I’ve delivered it. So will someone please give me lollipop? Thanks for the update Kevin. I am glad you are still liking your washer. Our ~12 year old Whirlpool Duet front loader died this week and the repair is a new drum for ~$600! My husband replaced the computer board for $200 a few years ago, so we are thinking it is time to just get something different. I have seen lots of people swearing they will never go back to a front loader machine again (mostly due to the mildew issues), so I am surprised that mildew is a possibility with your top loader. I wonder if that is just a “HE” machine issue specifically since I never had to leave the lid open on any of my “old school” washing machines. So many people I surveyed said stay with “old school washers” and several have the Speed Queen that your readers recommended last year. I am still doing research and going to hopefully get a good deal with Labor Day sales this weekend. PS – Here’s a lollipop for you! Thanks for your wonderful website. Lollipop, lollipop oh lolly lollipop. Does that count? Now get that song out of your head! Nice photo. Good that it folds the laundry so well. ((0)) Thanks for the review. I One virtual lollipop for you. I Sorry, Kevin. That’s the best I can do. I still miss my old GE “filter-flo” machine. Between full tubs of water and that filter, it really was the only one that ever removed pet hair. My newer low-water machine just spreads the hair to all the other clothes, and leaves hair all over the machine itself. Does anyone have any suggestions for pet hair? Kevin, don’t you have that issue, too? Hi Maraya – My clothes dryer (an inexpensive Kenmore) does a GREAT job removing pet hair from clothes. I clean the dryer filter after every load. I eagerly await you posts and videos. Your reviews are helpful and the Cabrio will be the next washer that I purchase. I hope you know how much information and inspiration that you add to your reader’s lives-well this reader. I can now conquer powdery mildew-which has been plaguing my hollyhocks and zucchini for years! I can also whip up a great carrot soup thanks you. I am so glad you like your cabrio. We all here HATE ours! It’s older than yours, and they did improve much about it the very next year after we had to buy ours as our very old Kenmore quit. This machine constantly puts dirty white streaks on all our dark clothes. Called the company the first week we had it. Of course they said they had never heard that before, and we must be doing something wrong. Told me I had to wash my dark clothes in hot water to dissolve the soap. Ridiculous!!! The store wouldn’t do anything either, even though we sent numerous pictures of the white streaks to both. We put lots of extra water in the tub to try and dilute the soap more, even wetting the clothes before starting the machine, but nothing helps. Yes we are using the correct type of soap. Have I said how much we hate this machine?!? Sticking with my old fashioned top load, agitator whirlpool. Why did buying an appliance become such a complicated event!? Maraya, I have 2 long hair cats so we were always covered in hair. Since using plain white vinegar as a fabric softener, our clothes no longer have hair on them when they come out of the wash. Also boticed not as much lint in the dryer screen. I agree with Lynne above. I hated ours. Could not get clothes clean because you have to use such little amount of soap or white streaks happened because not enough water to rinse. I fought with them for a year and went back to Maytag front loaders. Love them! Best of luck to you, I’m glad you like your Cabrio. Hi Kevin. Thought I’d throw in a load on the Cabrio for those interested. I’ve had mine for 4 3/4 years and am awaiting my first repair. My family went from myself and husband to 8, when my family expanded to include my son and his. The washer has held up very well and does a very good job on all cycles when heavily used. (15+ loads /week). Now it has a little something going on with the drain pump. I’m highly suspicious of something being left in a pocket that has created the problem. A lot of folks are using it now, including a 12 year old granddaughter who seems to think every day is another episode of Project Runway. To get her attention on this subject, she was instructed to do all her own laundry. Great lesson for her, not so good for our machine. Not the Cabrio’s fault. I do think it’s a fine choice for a large family, and it does use way less soap and water. Responding to the comment about the white streaks. Yes, that happens. But only when you are not cleaning your machine often enough. 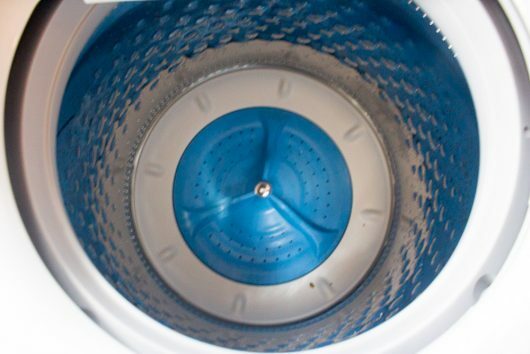 I found info on line when I was having trouble Clean the machine more often and if you must wash a dark load right after your fluffy white bath towels, wipe the drum with a dampened terry cloth. Problem solved. Sarah – The white streaks are from the detergent, not lint. I don’t have white towels, only darker ones. I have used the tablets that they recommend to clean the tub, but the last time the tablet simply would not dissolve! I ran it through 3 times and it wouldn’t dissolve. Tried another, same thing. This machine has been the bane of our existence. 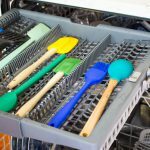 The matching drier is not much better – it NEVER dries fully on the first time through, no matter what setting we put it on. We each do our own laundry here, with different settings, same thing every time – doesn’t dry fully. I am so over these 2 machines and will never buy Cabrio again. Kenmore washing machines seem to be the best around …enough said here.. I was really excited for you Kevin when you said you got the Cabrio! Hope it serves you and Mr. Fox well for many more years! SPEEDQUEEN!! This machine is a dream. I am able to completely control both the time and the water level. I can soak loads as long as I wish. Perfect for an obsessive like me. Regular loads..finished in 28 minutes. Usually I depend upon Consumer Reports for appliance reviews. CR, for an unknown reason, never included the SpeedQueen so it took a lot of digging to find ratings and reviews, but it can be done. Thrilled with my machine? That is an understatement! Betty, Whirlpool is the manufacturer of Kenmore. failed over the years to put money into continued product development. the older ones. After several breakdowns, I replaced mine with a Speed Queen and have been really happy with it for the last 4 years. Hey, Kevin, three lolly-pops for the infomative post, two for folding the laundry, and 5 for an all-around great blog! An update to my post #1 above… After extensive research, and watching “loads” (wink!) of reviews online, we decided to purchase a Speed Queen. Then, at the 11th hour, discovered that due to new government regulations, the Speed Queen had been redesigned and the quality is not the same in the 2018 as it had been in years past. So, we researched further and purchased a commercial grade Maytag washer. (Very “old school” and durable) I’m looking forward to its arrival next week. I’m with the folks who HATE their Cabrio. So wish I had never bought it. Mine is a top loader with a glass top and without an agitator. I have never had clothes so tangled as these come out. I have to spend all kinds of times untying shirt sleeves and pants legs and anything that comes between them. It does NOT clean well. Because it has the glass top, I can see what is happening during the cycle. Frequently you can see that large swaths of fabric hardly get wet. It gets off balance at the drop of the hat. Sorry to say that I bought TWO of them at once because I am a fiber artist so I have one in my house and one in my studio. Big mistake. Speed Queen is the way to go. Our Maytag top loader quit after four years due to ball bearing issues. Mechanic said it would cost nearly as much as new to replace parts and pay labor. He recommended Speed Queen which is a commercial washer, top loader. Comes with 5-7 year warranty and parts are affordable and available. Costs more to purchase but I know it is going to hold up to our laundry list of laundry days!! I’ve gone through Maytag and Whirlpool. Definitely recommend Speed Queen. 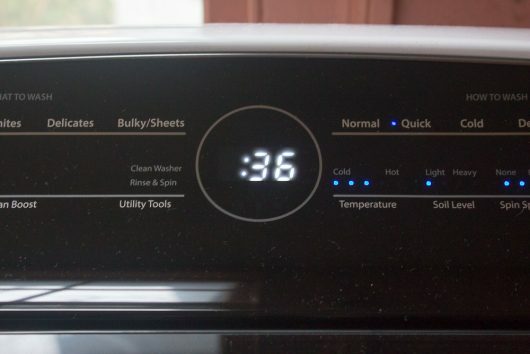 Maytags products were compromised when Whirlpool bought the company several years ago. After several Maytag ‘disasters’, and very costly ones at that, I finally purchased a Speed Queen, and it has been such a pleasure to use. Compared to all the other brands, including the last three Eco-friendly Maytag’s that I have owned, it could be compared to living in Hell and finally arriving in Heaven! It will do anything that I want it to do–any Eco-wash, filled-up tub, really dirty, on and on, all demands from my busy, farm life. I have NEVER had white streaks, odors, noises, disappointments and it doesn’t take an hour and a half to do a load. I have in my basement two of the previous Eco-Maytag’s, that function just as well as they did when they were purchased, and just as well as the engineers at Maytag designed them—but certainly NOT to my standards and wishes. They will ‘die’ there. The last one went bye-bye with the installers of the Speed Queen. I also have a Maytag that was my mother’s which is about 35 years old, and it just keeps chugging away, cleaning anything very well. The “Lonely Maytag Repairman” which you may recall from past year’s commercials is a big joke and a big fat lie in recent years. Just try to get answers and resolutions to problems and complaints. At least in my experience, it is like talking to the wind. So— there is my two cents worth which turned into more than two cents!!! I didn’t realize that only SpeedQueen has a soak option. I don’t like my replacement and if I was in the market again I’d get the SpeedQueen – I like controlling the water level, temperature, etc. I had a shirt that had several blood stains on it, it took 2 full washes that included spot spraying for blood, one additional separate soak in a large pan with Oxyclean and another wash to be satisfied . The dealer soft-pedaled the SpeedQueen mainly because of the price difference – which today I would gladly pay. Hey Kevin. You and the head shrinker may not have mechanic’s overalls to wash, but you are an avid gardener. That’s a lot of dirt and manure! Surely that equals any mechanic’s wardrobe! What a sad state the world has come to when we say “it’s been a year and no repairs”. I’ve had my old Miele for 23 years and the only time I’ve had the service technician out to that (or our dryer or dishwasher for that matter) is when we moved 11 years ago and had to have the appliances de-installed and re-installed. Guess they don’t make things like they used to. I agree with Kathryn Weber…I have not seen such a knotted, tangled mess of clothes come out of a washer! Absolutely awful! I have a front loader and love it. I was also told to leave door open after every wash and have no issues with mold. I wipe it out around the rubber once in a while and it does a great job. I was told one other thing to do to keep it running efficiently. 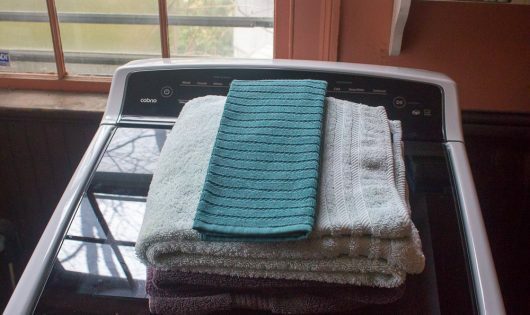 I too use the express wash done in 15 minutes but was told to add one extra rinse at the end to remove any left over soap in the washer so it takes a total of 18 minutes total and my clothes are clean and fresh. I was also told to use the least amount of laundry detergent, to not even fill it up to the normal amount as this detergent is so efficient you don’t need much. I’m a happy camper! Glad yours is doing well. Now where did I leave the lollipop? Speed Queen girl here. Had an LG front loader that lasted 10 years, but spent the whole time fighting the mold issue. Clothes are now clean again!! I too have a love affair with my Speed Queen. I chose it because my local farmer friends use it and they’re tough on their equipment. It has a large capacity and very few bells and whistles -( who needs them or uses them) so it’s much sturdier then your fancy machines. And it’s made in the USA! I can’t recommend it enough. I have a Maytag Bravo top loader washer. I was getting white streaks on dark pants and found that if I do the dark colors only in small loads, I don’t get the streaks. PS- I’ve had this washer 5 years and don’t like it. Tangles clothes. Speed Queen for me, too! My Maytag, purchased early 1980’s has been a gem. I have it serviced – don’t wait for a breakdown – once a year. $50-$60. They obviously don’t service today’s products unfortunately. I hope it outlives me. My clothing is clean, my dryer doesn’t have a buildup of crud because it cleans wonderfully – even with a shedding dog the past 15 years. We are far too wasteful with our resources – things should last. I have had my Cabrio washer & dryer for two years! Love them! I always use the extra rinse option as I am sensitive to a lot of detergents. My machines get used a lot for all types of loads & have never had any white streaks on anything. I researched for months before I purchased these & have been very pleased with them!! !